Venice is a very particular city for logistics but overall regard the "normal" behaviour of most local services providers, so you�ll better read carefully our Important Warnings section by section. Even though this Guide allows email and online booking on all kind of Hotels, from cheap Bed and Breakfast lodging to budget and luxury Venice Hotels, the first things you�ll need to know are how to reach Venice first, and then how to reach your booked Hotel. This Venice Hotels Guide shows the availability of accommodation in Venice Hotels and helps you to locate them on the Venice Map. Venice was first connected to the Mainland by the railroad bridge built by the Austro-Hungarian Empire. It ends in the Northwest side of Venice, in an area that, of course, is full of Hotels. Nevertheless - your - hotel could be quite far. A Venice Hotel located, I.E., in St. Mark Square�s zone, would require a walk of about half an hour. One in Castello 45 minutes or more. Just in front of the Railway Station, the bus boats are available to spare you a good part of the walk. You can count on veniceXplorer map�s bus-boat stop search to locate where it will be more convenient for you to disembark. When you locate your chosen Venice Hotel on our maps, indeed, locating the closest two bus boat stops is just a click away. Venice bus boat fares are not exactly cheap, but very, very convenient in front of those of the water taxi, as told before. Parking a car in Venice is quite an all sort of a job also if you are accommodated in a very Luxury Hotel. Between the hundreds of Venice Hotels in the Historical Centre, just one has its own garage, this one, located exactly - in - Piazzale Roma. Aside the Venice Lido Hotels, of course. 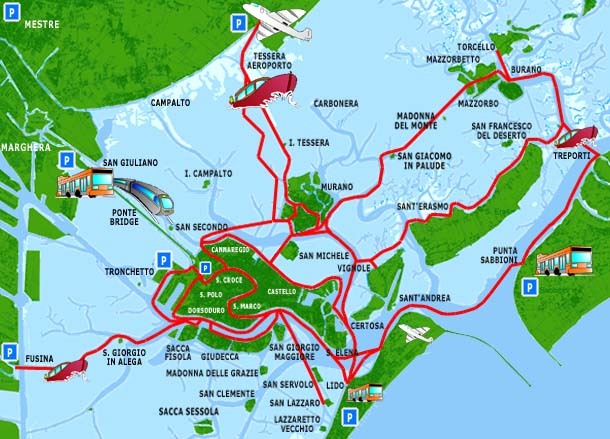 You can reach Venice Lido Hotels by car with a ferry Boat. If you are not going to book that particular Venice Hotel or to go to Lido, your choices to park the car are listed below. Are the nearest to the Historical Centre of the city, therefore to the Venice Hotels. Sad to say, they are also very expensive: more than 20 � a day. A day, not twenty-four hours: if you arrive at 23:50 and leave at 00:10, those 20 minutes will cost you a day. Also very near to the Historical Venice, that you can reach by bus boat, by the water-taxi of the local cohoperative "Consorzio Isola Nuova" and by the public bus connecting with Piazzale Roma, the car terminal of Venice. Parkings and water taxi in Tronchetto are cheaper than Piazzale Roma ones. Take the first slip road on the right after crossing the Lagoon Bridge. This is the choiche when you just need to drop passengers and luggage and go back to park the car somewhere else. A bus boat stop is at hand, but you cannot leave the car there. Take the second slip road on the right after crossing the Lagoon Bridge and ask to the gatekeeper for a luggage-discharge permission at Santa Marta. Are located just at the beginning of the bridge across the Lagoon, Mainland side. You�ll need to take a bus to reach Piazzale Roma in five minutes. These parking are open sky and quite cheap, some � a day. be aware not to pass over these parking: they are on the right few metres before the flyover that precedes the bridge across the Lagoon. If you miss them, you�ll have to make a U turn few hundred metres more over, climb the fly over and have a detour on the Trieste joint. If you come to Venice from East, let�s say from Trieste, you can still reach San Giuliano Parking turning the first road right after the top of the overpass. Do not turn right on the top, or you�ll have to go to Mestre and come back, three plus three kilometres. Just before the San Giuliano overpass, illegal "park men" wearing guard-like hats, will try to stop your car and drive it to a "safe" parking. You will pay to leave the car in a free, unattended area. Just do not stop and cross the flyover. They are more far from the Historical Centre of Venice, still they are on the border of the Venice Lagoon. You can take a bus boat from there to the Zattere (journey will take about 45 minutes) and then walk to the Venice Hotels. On the opposite side of the Lagoon regard to Fusina. You�ll reach the Venice Hotels in the Historical Centre taking a Public Service motor ship until Lido or St. Mark�s Square. From Punta Sabbioni a ferryboat service to Lido is also available, allowing you to reach Venice Lido Hotels by car. Parking in Punta Sabbioni will cost you few � a day. In front of Mestre Railway Station you�ll find some not so expensive parking. From there you�ll reach Piazzale Roma, the Car Terminal Venice�s Historical Centre in 15 minutes by bus. No vehicles are admitted in the Historical Centre of Venice, not even simple bikes nor Venice Hotels guests ones. You could push your one by hand, up and down Venice bridges until your booked Venice Hotels, but be aware to have a confirmation from the Hotels themselves. Some Hotels in Venice are very small, and they might have problems accommodating bikes even in your own room, cause stairs are usually very narrow. Venice Hotels guests, as well as other tourists, benefit of some free parking spaces in Piazzale Roma (see our detailed map at Motocycle Free Park menu item) for their bikes and motorbikes. These parking are unattended, so you park for free but at your own risk. Whenever you are a Venice Hotels guest or not, if you are a biker do not forget to visit the beautiful collection of photos at Motoclub Mestre site.